Several good routes are possible from Cupola Basin Hut, including some buttresses of reasonable quality rock. Cupola Basin Routes A marked track to Cupola Basin Hut leaves the Travers Valley at a small clearing. At 1370m and with spectacular views nearby the hut is well sited for climbs. An imposing series of red rock buttresses. One route goes up the first red buttress on the left of a faultline on the right of the face. The first two pitches are loose, with a grade 16 crux on the second pitch. 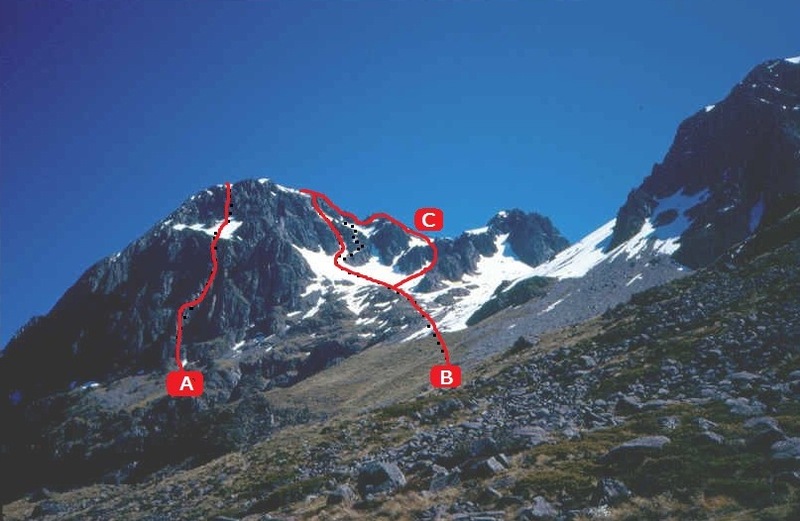 Three more pitches lead onto easy ground, then traverse to a final pitch which leads to the top of the faultline. Further left, there are two more routes (grade 13). There is also a route on the buttress right of the faultline (grade 16, reasonable quality rock). From Cupola Basin Hut, sidle up to a big scree fan on the North Face. 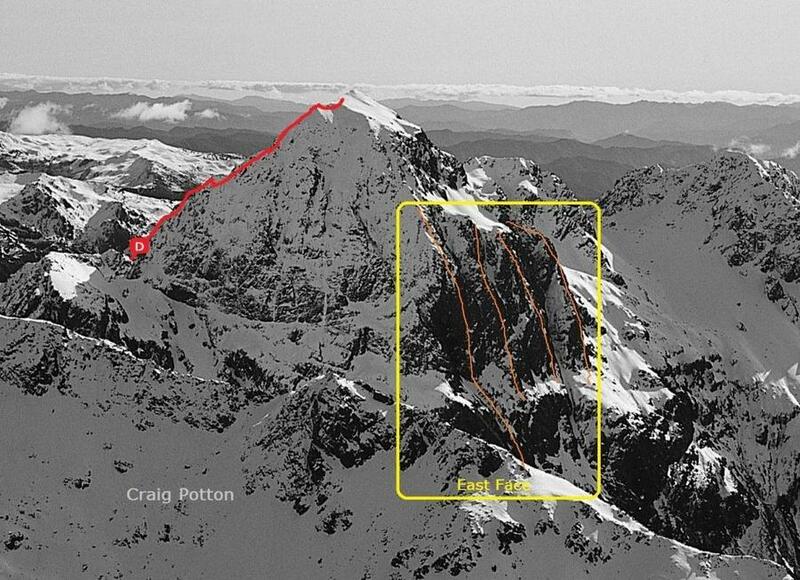 The usual summer route is a zigzag ledge on a rib between deep gullies. A hanging scree shelf above is crossed to its eastern edge where firm rock leads directly to the summit. The gully left of the zigzag ledge provides good climbing when snow-filled. G E Mabin and others, Dec. 1933. A very narrow gully starts from the left edge of the North Face fan (North Face route) and exits on easy slopes below the summit. The route is visible from points south-west of the hut. Belay up a 2m step of water ice over steep rock (small wedge or piton needed). Continue over a smaller ice step and then easier ground. Note that the steep walls above the gully catch the early morning sun, so be sure to reach the upper gully before the hummers reach you. This is gained from the top of a scree fan between Cupola and a dome-shaped peak to the north. Shaky pinnacles and a deep notch make the route difficult. This ridge is gained from Gunsight Pass and sweeps steeply up to the summit. An excellent winter climb. R L Scott, A Banks, Jan. 1968.